Luigi Galvani was an Italian physician who demonstrated what we now understand to be the electrical basis of nerve impulses when he made frog muscles twitch by jolting them with a spark from an electrostatic machine. Luigi Galvani was born in Bologna, Italy, on September 9, 1737. He studied at the University of Bologna, where, in 1759, he earned his degree in medicine and philosophy. After graduation, he supplemented his own research and practice as an honorary lecturer at the University. His earliest published papers covered a wide range of topics, from the anatomy of bones to the urinary tracts of birds. By the end of the 1760s, Galvani had married the daughter of a former professor and become a paid lecturer at the University. In the 1770s, Galvani’s focus shifted from anatomy to the relationship between electricity and life. 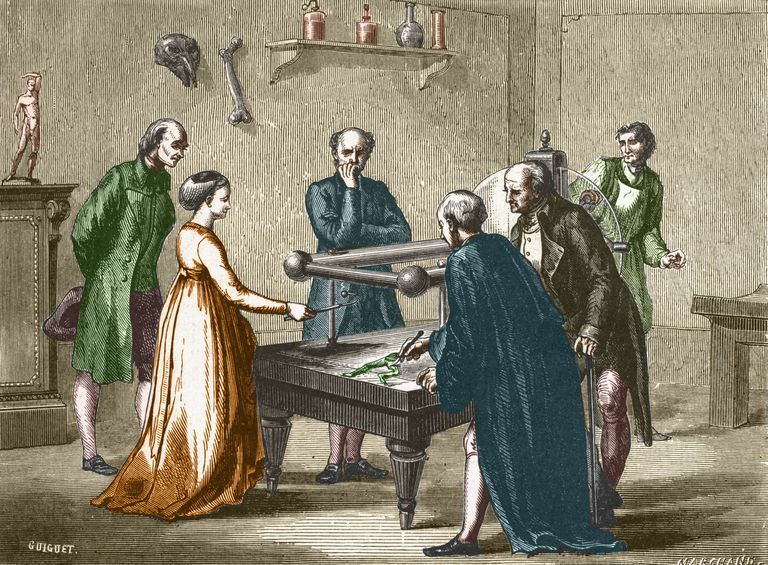 As the story goes, Galvani one day observed his assistant using a scalpel on a nerve in a frog’s leg; when a nearby electric generator created a spark, the frog’s leg twitched, prompting Galvani to develop his famous experiment. Galvani spent years testing his hypothesis—that electricity can enter a nerve and force a contraction—with a variety of metals. Later, Galvani was able to cause muscular contraction without a source of electrostatic charge by touching the frog’s nerve with different metals. After further experimenting with natural (i.e. lightning) and artificial (i.e. friction) electricity, he concluded that animal tissue contained its own innate vital force, which he termed "animal electricity." He believed this to be a third form of electricity—a view that wasn’t altogether uncommon in the 18th century. While these findings were revelatory, astonishing many in the scientific community, it took a contemporary of Galvani’s, Alessandro Volta, to fine-tune the meaning of Galvani’s discoveries. A professor of physics, Volta was among the first to mount a serious response to Galvani’s experiments. Galvani proved that the electricity did not emerge from the animal tissue itself, but from the effect produced by the contact of two different metals in a moist environment (a human tongue, for instance). Galvani would attempt to respond to Volta’s conclusions by doggedly defending his theory of animal electricity, but the onset of personal tragedies (his wife died in 1970) and the political momentum of the French Revolution would do him no favors. After Napoleon’s troops occupied Northern Italy (including Bologna), Galvani refused to recognize the Cisalpine—an action that led to his removal from his University position. Galvani died soon after, in 1978, in relative obscurity. Galvani’s influence lives on, not only in the discoveries that his work inspired—like Volta’s eventual development of the electric battery—but in a wealth of scientific terminology as well. A is an instrument used to detect electric current. Galvanic corrosion, meanwhile, is an accelerated electrochemical corrosion that occurs when dissimilar metals are placed in electrical contact. Lastly, the term galvanism is used to signify any muscular contraction stimulated by an electrical current. Just as striking as his recurring presence in scientific circles is Galvani’s role in literary history: his experiments on frogs, which evoked a haunting sense of reawakening in the way they motivated movement in a dead animal, served as a noted inspiration for Mary Shelley’s Frankenstein.